Mardi Gras parades are organized by Carnival Krewes that begin parading at least two weeks before Fat Tuesday. The float riders toss throws to the crowd who often yell, tThrow me something, Mister!” The most common throws are strings of colorful plastic beads, aluminum or wooden doubloons usually pressed with krewe logos, decorated plastic throw cups, and small inexpensive toys. Major krewes follow the same parade schedule and route each year, mostly along St. Charles Avenue and Canal Street on the upriver side of the French Quarter. The traditional colors of Mardi Gras are purple for justice, green for faith, and gold for power. Rex, the King of Carnival, selected these three colors for their first parade in 1872, and they continue to symbolize Mardi Gras today. 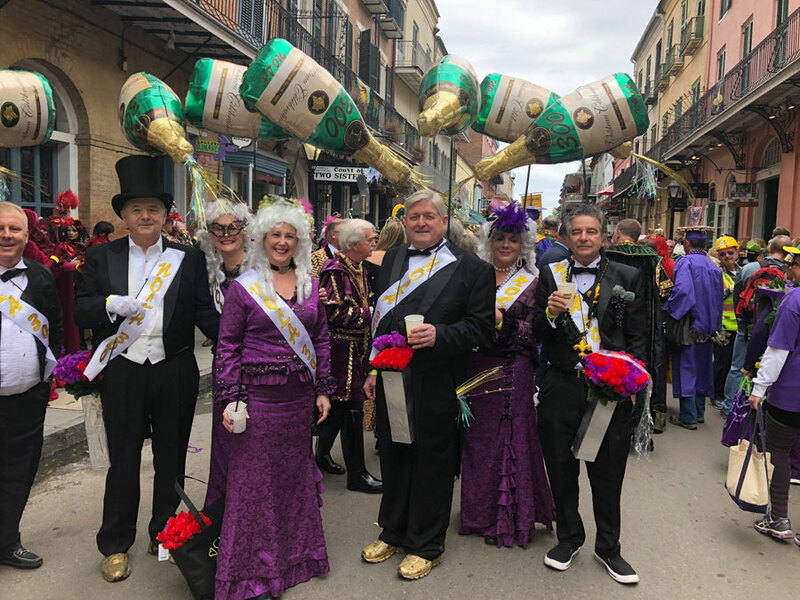 Before the big day of Carnival, one of the marching krewes to catch if you love wine is the Krewe of Cork, founded in 2000. “We celebrate Wine! Food! Fun!” says King Patrick van Hoorebeek. This Bacchanalian group strolls down Royal and Bourbon Streets on February 22nd. They begin at The Court of Two Sisters at 613 Royal Street at 3 p.m. Over 400 members parade through the French Quarter, donning wine and grape related costumes. There will be wine, of course, a brass band…and more wine! On Sunday, March 3rd, the Krewe of Bacchus, the god of wine, will parade; this “Super Krewe” is a highlight of the Carnival season. Its floats are bigger and more spectacular than most, and they always have a national celebrity as king leading their parade. With more than one thousand members, and 32 animated floats, the Krewe of Bacchus is revered as one the most spectacular krewes in Carnival history. Signature floats, such as the Bacchagator, a 105-foot three-piece float that accommodates 86 riders, are among the many striking and eye-catching floats. This year’s theme is “Starring Louisiana” so float subjects include Interview with a Vampire, A Streetcar Named Desire, and NCIS: New Orleans. On Lundi Gras, March 4th, the Zulu Lundi Gras Festival is a fun-filled day allowing locals and visitors to get a close-up look at the characters who will parade down St. Charles Avenue and Canal Street on Fat Tuesday. The festival is free and the six hundred members of the Zulu Social Aid and Pleasure Club welcome all to enjoy an exciting day of food, music, arts, and crafts along the beautiful riverfront of Woldenberg Park from 10 a.m. to 6:30 p.m. The festival features local, world renowned, and Grammy Award winning entertainers performing Cajun and brass band genres on three stages. The Zulu King and Queen will arrive at 5 p.m. Later on Lundi Gras evening, the Krewe of Orpheus will stun revelers with one of the most eagerly anticipated parades of the season. It was founded by our local singer, Harry Connick, Jr., and is inspired by music. Orpheus flaunts signature floats such as Leviathan, a smoke-breathing sea monster, and Smokey Mary, a multi-float locomotive with train cars. Finally, the long-awaited Fat Tuesday arrives on March 5th! Be ready for a fun-filled day of Bacchanalian revelry! Don a costume to become a part of the party rather than just a spectator! One of the first marching krewes you will see coming down Canal Street and rolling into the French Quarter around 9 a.m. is Pete Fountain’s Half-Fast Marching Club together with other local jazz musicians playing through most of the parade. After a brief interlude on Canal Street, the Club enters the French Quarter at Bourbon Street and wanders through the French Quarter, eventually ending at the Riverfront Hilton in the early afternoon. 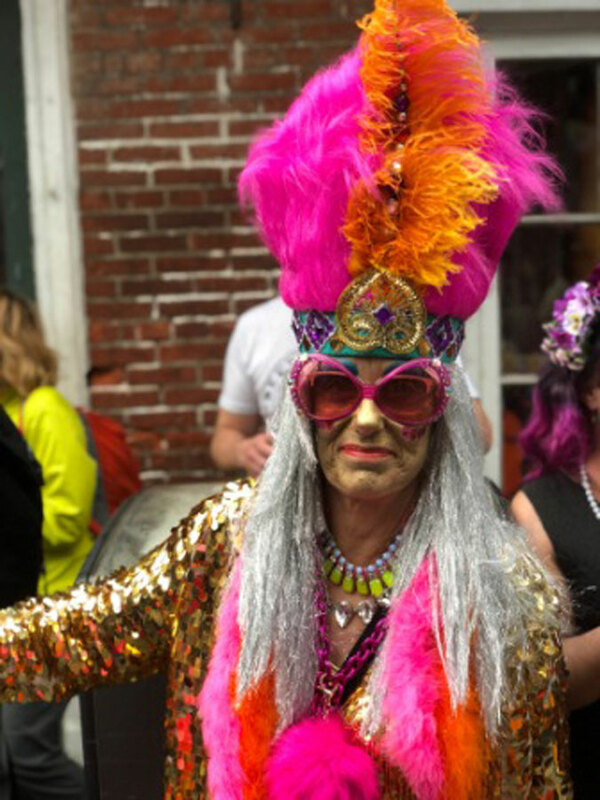 Later, at 11am in front of St. Louis Cathedral, the Krewe of Elvis (KOE) is one of a handful of Krewes that have been issued a city permit to stage a parade in the French Quarter on Fat Tuesday. The Krewe is accompanied by the renowned Treme Brass Band. 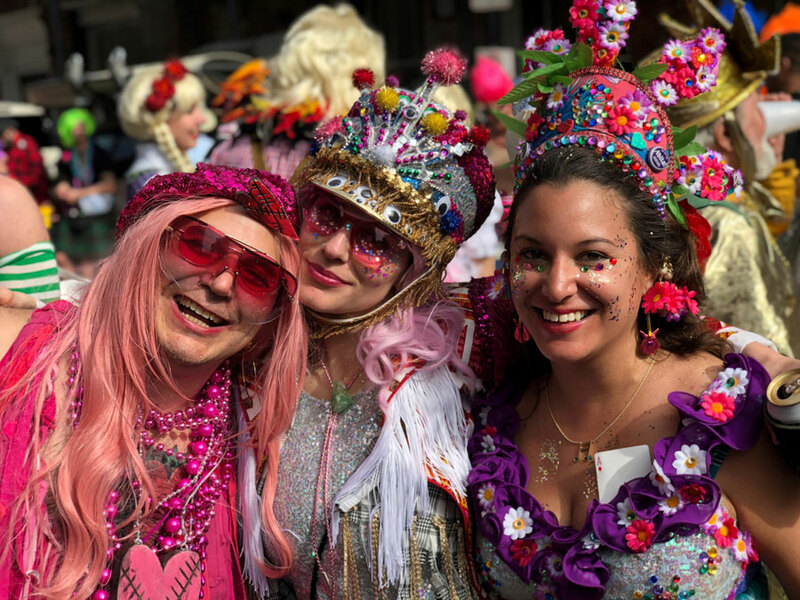 Following Pete Fountain’s Half Fast Marching Club, Mondo Kayo Social and Marching Club triumphantly dances down Canal Street with the color and joy of Caribbean Carnival, then continues on to Jackson Square. Finally, they wind their way over to Chartres at Frenchmen Street where they dance and play until dark. For a walk on the wilder side, the Bourbon Street Costume Contest on the corner of St. Ann unfolds in all its feathered and leathered glory at noon. This is an adult oriented event, so look elsewhere for family friendly viewing. The old-line krewes of Zulu, Rex, and Proteus will stage high-quality, all-original parades down St. Charles Avenue to Canal Street, as they have every Fat Tuesday since the mid-19th century. The most anticipated catch of the season is the treasured handmade Zulu coconut, but you don’t usually catch this one… they are handed out gently to those close by for safety reasons! Rex, the oldest parading Carnival organization, uses traditional materials and rebuild their floats on old wagon chassis with wooden-spoke wheels. Throughout the ages, the sun has been a source of wonder and inspiration to poets, writers, and artists. Rex will present its 138th parade themed “Visions of the Sun,” beautifully portraying these legends, myths and colorful images. If you are lucky enough to be in the French Quarter for Valentine’s Day or just want a nice evening out with your sweetie, a romantic little oasis is Patrick’s Bar Vin where you and your sweetheart can disappear into a little alcove and feel like you've been transported to wine country. If the lush patio with soothing fountain is not your scene, go inside to the cozy couches that will make you want to settle in for the evening. Treat yourselves to the cheese platter to set off the wine. Named a top ten wine bar in the U.S., it is managed by New Orleans’ own bon vivant, Patrick Van Hoorebeek. You will discover the warm and relaxed yet elegant gathering place full of locals and wine enthusiasts from around the world. For Valentine’s Day or any romantic experience, try “Lisa’s Temptation,” made with moscato, Mathilde Cassis, and fresh lemon; or the “Bar Vin Kiss,” a shot of bubbles of your choice! 730 Bienville St., 504-200-3180. Effervescence, an elegant lounge on the edge of the French Quarter specializing in sparkling wine and luxurious sharing plates, is a delightful place to make any evening romantic. Bubbly flights create an experience to taste through Champagnes or sparkling wines of the world. Caviar service is the perfect way to start a sparkling evening; options include a royal reserve sturgeon caviar to vegetarian and budget friendly lentil caviar to start your evening. Try their “Red, Red, Red Wine” flight (Ulysse Collin Rosé de Saignée, Croci Frizzante Rosso, and Bertolini Lambrusco) which presents various shades of red for Valentine Day! 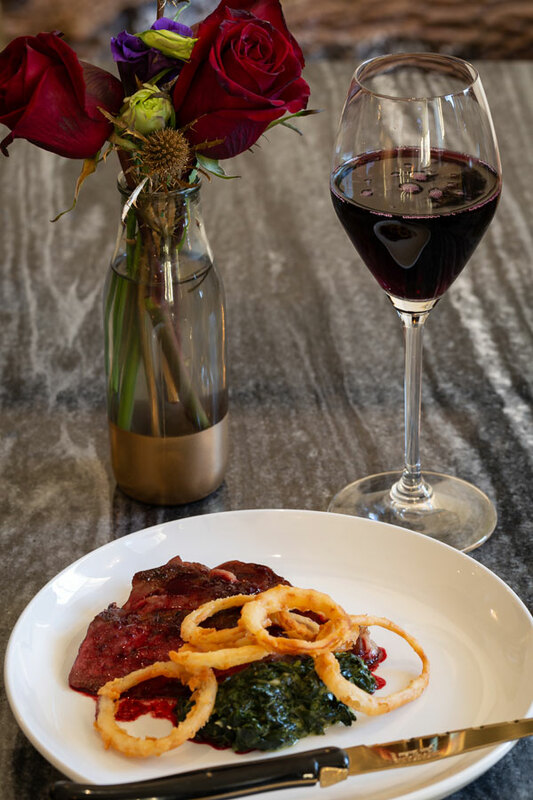 To hit all the marks, try their four ounce dry-aged Louisiana Wagyu beef, creamed kale, beet bordelaise and onion rings, a version of the classic steakhouse dish made with local ingredients and our Bertolini Lambrusco Secco ’16 bubbles. Save room for the Grapefruit dessert, back by popular demand, featuring Delamotte Blanc de Blancs Champagne Sabayon, caramel, meringue, frozen grapefruit and 24 karat gold. Bring your friend or lover for a bubbly gastronomic experience! Visit nolabubbles.com for reservations and more details. 1036 N. Rampart Street, 504-509-7644. 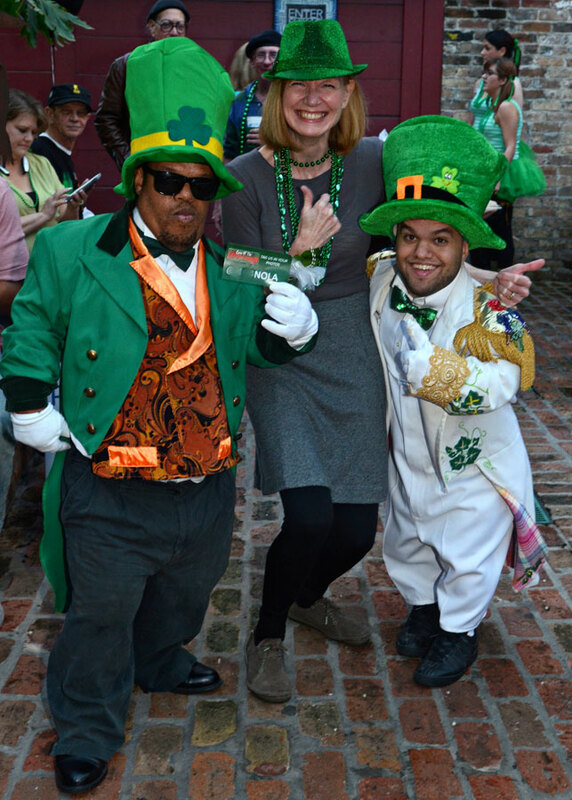 Just when your head stops spinning from Mardi Gras and Valentine’s Day, don some green clothing and claim to be Irish because St. Patrick's Day is celebrated in the French Quarter in the form of more parades! It's always the perfect season for another celebration ... after all, it's New Orleans, and we love to parade and party in the streets! Men and women in walking groups from various Irish marching clubs in the city dress in tuxedoes, kilts, and costumes of green to give out white and green flowers and beads, drink green beer or Guinness Stout, and kiss lucky parade goers along the route, all to the tune of traditional Irish music of bagpipers and drummers. The parade floats’ most famous throws are cabbages, carrots, onions, potatoes, everything needed for a hearty Irish Stew, and Moonpies! On St. Patrick’s Day or any time you want the Luck of the Irish, Erin Rose is a neighborhood watering hole that is always newcomer friendly. Out-of-town regulars and residents mingle easily in this cozy nook that feels like Dublin. Bartenders serve frozen Irish coffees and from-scratch Bloody Marys with Guinness! Killer Poboys, a pop-up sandwich shop in the back, dishes out cheeky sandwiches like rum-braised pork belly, blackened Gulf shrimp, and whiskey-spiked grilled cheese, just in case you get hungry! 811 Rue Conti, 504-522-3573. On Friday, March 15th, Molly's at the Market Irish parade rolls at 6 p.m. from 1107 Decatur Street. Arrive early and imbibe in an Irish Coffee, a Guinness or a Harp Irish beer, and mingle with the many kissing tuxedoed marching groups and riders in horse-drawn carriages. 1107 Decatur St, 504-525-5169. On Sunday, March 17th, the Downtown Irish Club Parade begins in the nearby Bywater neighborhood at 6 pm, and proceeds up Royal to Decatur, then up Bienville to Bourbon. The parade makes several French Quarter "pit stops" on its way, so be patient and hang out at Tujague’s at 823 Decatur Street. Order a green beer or an Irish Car Bomb cocktail and enjoy the camaraderie and let them stroll to you! Pace yourself because the next Saturday, March 23rd, the 48th annual Italian-American St. Joseph's Parade begins to float down Royal and Chartres Streets at 6pm. Though it includes sixteen floats, marching bands and a whole lot of guys with puckered lips dressed in tuxedos, only the marchers and bands are allowed to venture deep into the French Quarter. Ryan’s Irish Pub at 241 Decatur Street is a sure pit stop so relax with a Jameson Irish Whiskey or a Sazerac, the official cocktail of New Orleans since the middle of the 19th century, and let the party roll in. Just when you catch your breath from all the street parties and parades and get your beads packed away, it’s festival season! The 36th annual French Quarter Festival, April 11th through 14th, is the largest free music festival in the United States. The Second-Line Kickoff Parade begins at 10am at the 100 block of Bourbon Street and sachets to Jackson Square. More than twenty stages throughout the French Quarter celebrate local music and represent every genre from traditional and contemporary jazz to R&B, New Orleans funk, brass bands, folk, gospel, Latin, Zydeco, classical, cabaret, and international music, as well as a music stage for children and dance lessons. Our best restaurants create “The World’s Largest Jazz Brunch” as well as dinner in Jackson Square, the Louisiana State Museum’s Old U.S. Mint, JAX Brewery on Decatur Street, and Woldenberg Riverfront Park. This signature event features authentic local cuisine from renowned area restaurants. 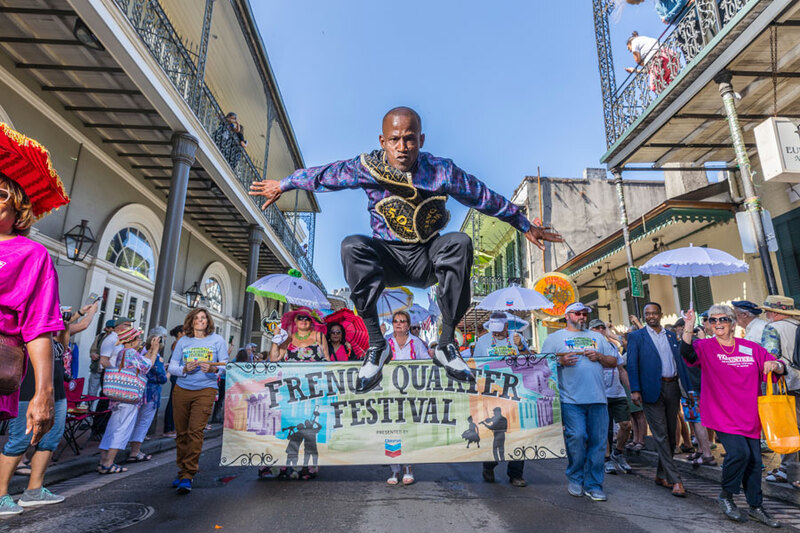 French Quarter Festival has been consistently voted “favorite festival,” “favorite food festival,” and “favorite event open to the public” by locals. French Quarter Fest is a good time to see the city from a different angle, the Mississippi River! Consider a romantic cruise on the last authentic steamboat on the Mississippi River, the Steamboat Natchez. They run daily, year-round, and feature dinner and daytime live jazz cruises. The daytime cruise includes a jazz pianist or trio along with live narration of the river sites and history. The 7p.m. dinner cruise features live jazz by the Grammy nominated “Dukes of Dixieland.” Boarding begins at 6:00p.m. Come aboard and enjoy New Orleans hospitality…Steamboat style! 600 Decatur Street, 504-569-1401. There’s never a dull moment as we live to celebrate life and our cultural heritage. Join our street parades, block parties, and festivals here in the French Quarter! So, “Laissez les bon temps rouler!,” which is our Cajun expression meaning, "Let the good times roll!" It strongly conveys our "joie de vivre" or "joy of living" attitude that pervades all who come to revel in the magical and celebratory festivities of the Vieux Carre!